Stunning, size 8 wedding dress. Perfect condition. I felt a million dollars in it. I would love for someone else to get the same enjoyment out of the dress as I did. 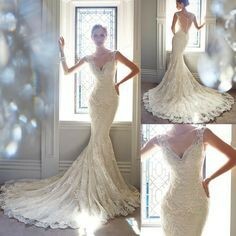 It has a beautiful lace, buttoned, shear back. It fits the body perfectly. I am 5'5 - 5'6 and has plenty of length. I also have an Italian veil that goes right to the end of the dress which completes the look. It really is an absolutely stunning, beautiful dress. I would be open to offers and am happy to send pics of me in it.